Joy is clumsy. It’s been known to cause shouting from rooftops and singing in the rain. Art is restrained. Even at its most chaotic—think Pollock and his fractals or Hendrix and his walls of sound—art is tempered by intention. Joy has no intention. The manifestations of joy cannot be restrained. The artist seeks what the joyful could not get rid of if they wished. There is plenty of pleasure and wit on display in “20, 000 Leagues Under the Sea.” One only wishes for a little more restraint. Clint Sheffer and Ann Sonneville’s adaptation of the Jules Verne adventure tale is certainly daring. Strawdog’s Hugen Hall is an unconventional space in which to stage theater. It has a slight floor plan and low ceilings, the latter posing a challenge to those wielding body-length harpoons. As the play moves along it turns the natural claustrophobia of the hall to its advantage. Its narrow passageways become adequate surrogates for the chambers of Captain Nemo’s proto-submarine. The live music that accompanies this production serves as an ideal metaphor for where things fall short. “20,000 Leagues” is at its best when at its most raucous. Its attempts at charming montage are hollow, especially when weighed against scenes of impressive physicality. For a play on a relatively thin budget, no expense was spared for the fight choreography. Even at such close quarters, the action feels real enough to cause concern for the actors, though I trust that the bulk of the rolling and heaving was planned. The underwater sequences and fight scenes are evidence enough: this cast works best as a group. While Mike Steele aptly conveys Professor Arronax’s myriad anxieties and Lee Russell’s brawny Canadian is as virtuous as his fine moustache, Kathrynne Wolf’s Nemo failed to pique my interest. A character of some conflict and depth in Verne’s text, Sonneville and Sheffer seem to be more concerned with atmosphere than execution. They leave Wolf little to work with and the result is anticlimactic. 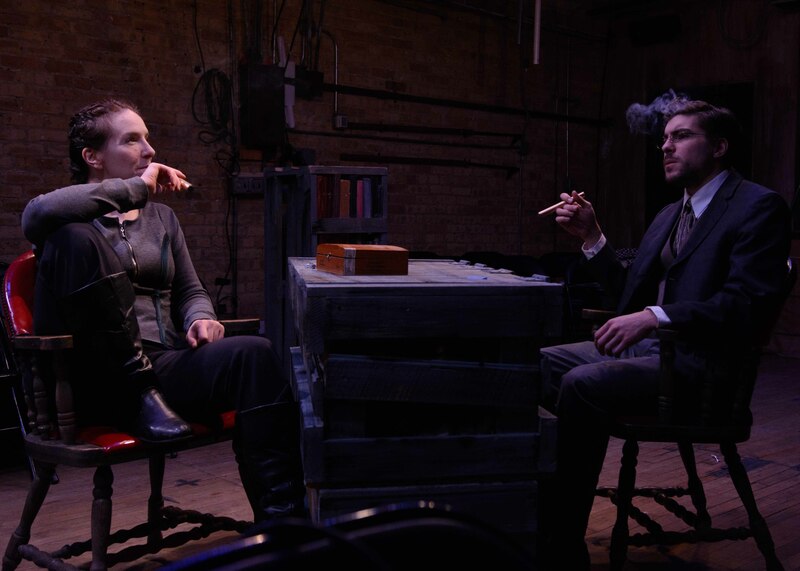 Strawdog Theatre Company at Hugen Hall, 3829 North Broadway, (773)528-9696, strawdog.org. $15. Through April 7.